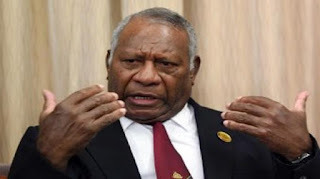 The President of Vanuatu, Baldwin Lonsdale has called on the Parole Board under the Vanuatu Correctional Service Department to do its job fairly. President Lonsdale’s statement was made after local media reported that the parole requests of incarcerated political leaders have been submitted to the Parole Board for consideration. “I am urging the Parole Board to do a thorough assessment of all detainees in Port Vila and in Luganville in order to ensure that all the inmates who meet the parole requirements must have their requests processed and submitted to the Parole Board for consideration. “The Board has a duty to ensure that every single detainee who has already served half of his (or her) sentence and who has obtained a report of good conduct from the Correctional Centre is given the opportunity to have his (or her) parole request submitted to the Parole Board,” President Lonsdale said. “There’s no second class ni-Vanuatu citizen and everyone should be treated equal in the eyes of the law. “When it comes to parole requests, we don’t want our citizens to accuse the authorities of leniency and favouritism towards political leaders over ordinary detainees. “Whether you’re rich or poor, whether you’re a leader, a minister, a businessman or a simple citizen, everyone has to be treated the same. “No one is above the law. Therefore I urge the Parole Board to do make sure that at its next meeting, not only the requests of the political leaders will be processed for consideration but also the applications of all the detainees who currently meet the parole criteria as I mentioned earlier. “The Board in question has to do its job fairly,” the Head of State concluded. Vanuatu Daily Post reports the Parole board, being an independent body, consists of members from the Judicial Service, Correctional Department, Women’s Affairs and Chiefs. According to media reports, the parole requests of two former Members of Parliament, namely the former MP for Santo, Serge Vohor and ex-Efate MP, Steven Kalsakau have already been submitted to the Parole Board for consideration. The Parole Board is expected to meet in the coming weeks to consider their applications. On the other hand, the authorities have recently rejected applications for parole submitted by several former MP detainees who had their sentences increased after they were found guilty by the Supreme Court of conspiracy against the state in an additional case.